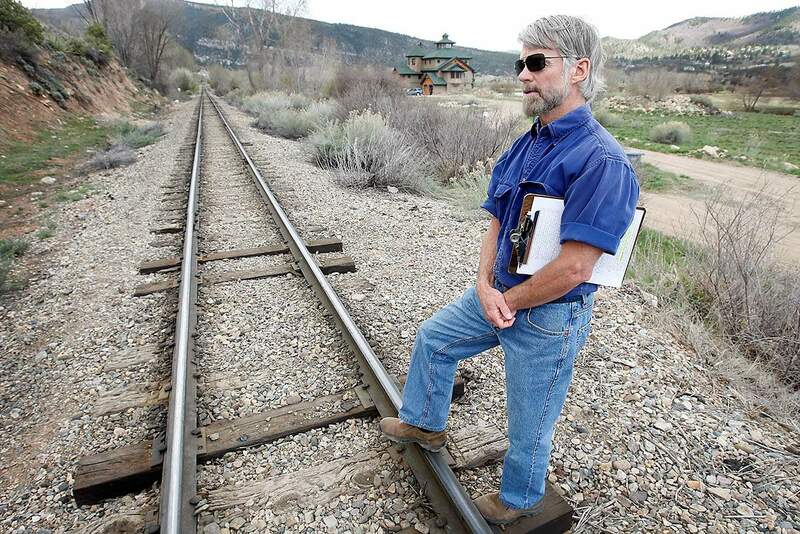 Tim Wolf, who owns property along the Durango & Silverton Narrow Gauge Railroad tracks, where the city wants to extend the Animas River Trail, notified Great Outdoors Colorado of what he perceived as a threat of condemnation directed toward property owners along the proposed northern trail extension. He is shown here in 2009 on his property. Great Outdoors Colorado dismissed an inquiry into whether the city of Durango threatened to use eminent domain against a property owner to extend the Animas River Trail. Wolf accused city staff of threatening to condemn his property to complete a 4,600-foot extension of the Animas River Trail from Memorial Park near 32nd Street to Oxbow Park and Reserve, in northern Durango. The trail will be built in an easement along the Durango & Silverton Narrow Gauge Railroad tracks, which crosses Wolf’s property. Not only did staff threaten him personally, Wolf said, but the threat of condemnation was written into the city’s contract with the D&SNG. The contract said the railroad would file a lawsuit on behalf of the city if condemnation was necessary. “My property is a part of this project and I was threatened,” Wolf said Thursday. At a public meeting March 11, Parks and Recreation Director Cathy Metz denied that the city ever threatened to use condemnation. On Thursday, Metz said the Animas River Trail is the Parks and Recreation department’s most popular amenity and the department looks forward to completing the northern extension. “We did purchase that easement from the railroad, and they’ve granted the right for the city to construct the trail,” Metz said. A letter written by City Attorney Dirk Nelson to GOCO in response to Wolf’s complaint said the city has the right to use the railroad’s easement to construct the trail extension, an issue that has been settled in court. The D&SNG filed a lawsuit against Wolf in 2011 seeking a judgment that the railroad has the right to offer its easement to the city for development, Nelson wrote. The civil action taken by the railroad to allow the city to use the easement “did not in any way involve condemnation,” he wrote. A district court ruled in 2012 that the railroad had the authority to grant the city access to its easement, Nelson wrote. Wolf appealed that decision, but the court of appeals in 2013 upheld the lower court’s judgment. The Colorado Supreme Court denied Wolf’s petition to further adjudicate the matter, therefore settling any doubt that the city may use the railroad’s easement for development, Nelson said. The outcome of the railroad’s lawsuit and the fact that actual condemnation was not used to complete the project, as Wolf acknowledged, “was enough,” Miller said, to rule that the city did not violate its agreement. But Wolf said it is his opinion that Nelson’s letter contains “lies, misinformation and innuendo.” GOCO didn’t give him the opportunity to respond to the city’s assertions, he said. Wolf maintains that he was threatened with condemnation, something that Nelson denied in his letter, and that other neighbors he has spoken with were also threatened. It’s his opinion that the dismissal of his complaint is an attempt by Durango and GOCO to “whitewash this story,” Wolf said.